When I discovered the joys of Zhou Nutrition’s Keto Drive, I wasn’t sure I would ever need to experiment with another exogenous ketone supplement. 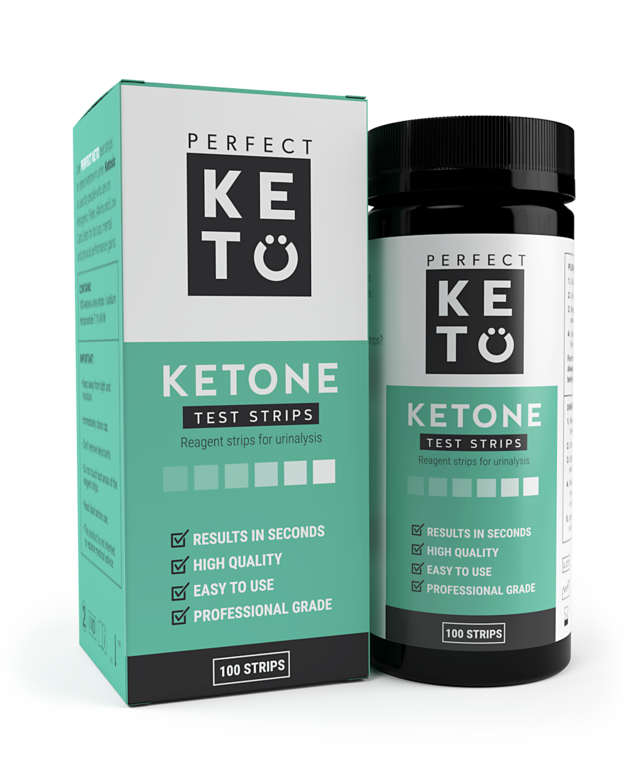 However, the brand Perfect Keto was on my radar because I was using their ketone test strips, and I became aware that they produced many other keto products including exogenous ketones (more specifically, BHB salts). 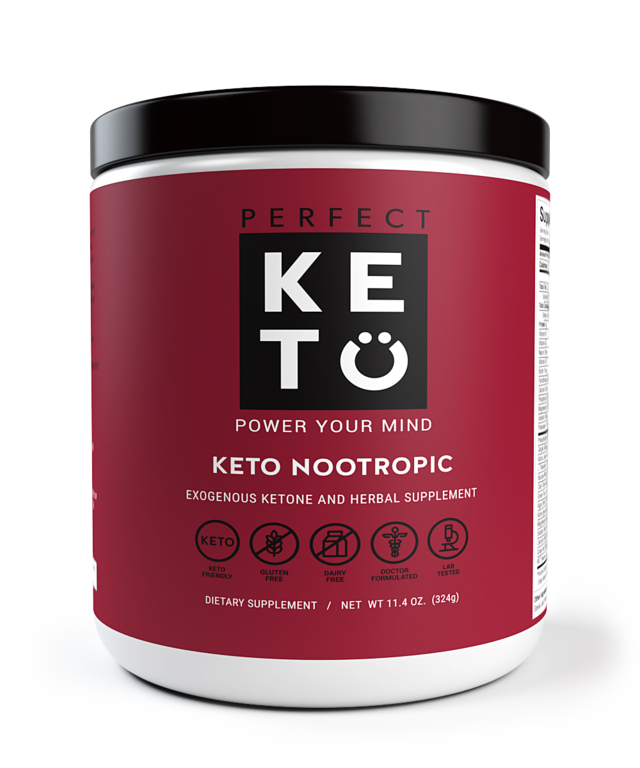 My curiosity eventually dictated that I needed to try Perfect Keto’s exogenous ketones. Now I’m reviewing the two flavors I sampled in case anyone else is curious about them! 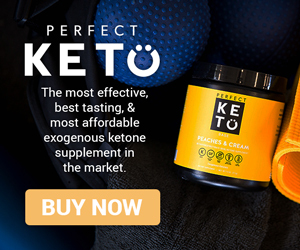 If you’re new to exogenous ketones and aren’t sure what they do, I recommend reading When and How to Use Perfect Keto on the company’s blog. Anyway, onto the review! This is a little different from the Keto Drive flavors, which are all fruity, whereas three out of the four Perfect Keto flavors are not. While Keto Drive’s Black Cherry, Matcha Lemonade, and Orange Mango might be a bit odd in your morning coffee, Keto Drive makes flavors that seem made for it. Previously, I had never thought to mix my ketones with anything but water, but now I was thinking of all sorts of concoctions. In addition to mixing the BHB salts with coffee, some of the Amazon reviews of Perfect Keto Base mentioned mixing it with almond milk. While I am hoping to one day try all four flavors, I decided to start out with two and settled on Chocolate Sea Salt and Peaches and Cream. As a chocoholic who is endlessly happy that chocolate is keto-friendly, I unsurprisingly chose to sample Perfect Keto’s Chocolate Sea Salt exogenous ketones before the Peaches and Cream. Now, I should acknowledge that the Amazon reviews were a bit mixed and that some people hated the taste of the Chocolate Sea Salt, and one of the complaints was that it tasted salty. Still, I’m a fan of salty chocolate and have an adventurous palate, so I went into the taste test expecting to love it. The fact that the powder smelled like brownie batter raised my expectations. The first time, I simply mixed the Chocolate Sea Salt with water by shaking it in a bottle. While it wasn’t as good as brownie batter, I was not disappointed by the taste! It reminded me of drinking chocolate (almond) milk. I hadn’t been sure what to expect when it came to mixing a chocolatey powder with water, but the Perfect Keto has a creaminess that made it work. Any saltiness I could detect was not overwhelming. If it tasted this good mixed with water, I was sure I’d love it with almond milk. As acknowledged above, not everyone loves it, so your mileage may vary, but most of us are drinking exogenous ketones for the effects foremost, and liking the taste is merely an added bonus. The second time I had Chocolate Sea Salt, I stirred half a scoop into a small glass of Trader Joe’s unsweetened almond milk with much anticipation. Mixing the powder with a spoon took some effort, but I was able to get every last chunk of powder to dissolve. Unfortunately, I did not love what I tasted. For some reason, the saltiness was way more noticeable in the almond milk. I couldn’t shake the feeling that I was eating Play-Doh (don’t ask). Not great, but I had already planned to add Four Sigmatic’s Lion’s Mane Mushroom Coffee to my drink, so there was a chance to turn things around. In case you’re not aware, Lion’s Mane is an awesome nootropic. I love mocha, and I needed a caffeine fix. As I emptied the packet into my ketone almond milk, I wondered if I might be making a mistake. The Lion’s Mane was an instant coffee meant to be used in hot water. As I stirred, I worried that it was not dissolving as it should, but eventually it did. As soon as I took my first sip of my mocha mushroom ketone beverage, I knew that this was my favorite way to drink Perfect Keto Chocolate Sea Salt ketones. The coffee flavor masked the saltiness of the BHB salts and made for a tasty drink that delivered caffeine, nootropics, and ketones all at once. P.S. 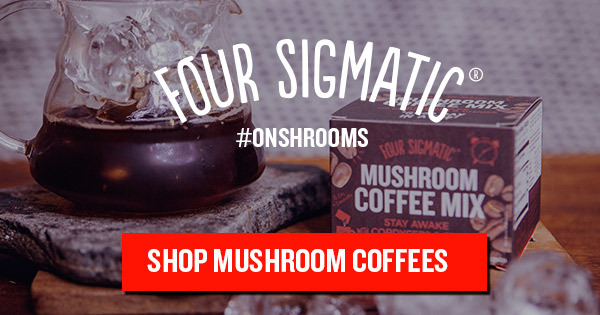 If you want to try this for yourself, make sure you use my code FISHYKETO for 10% off your shroom coffee when you order from Four Sigmatic’s website. Update 5/12/18: The other day, I tried Perfect Keto Chocolate Sea Salt again with almond milk. This time, I used Silk’s unsweetened almond milk and poured myself a bigger glass, and I liked the results much more! The salty taste I mentioned above was not an issue for me. Peaches and Cream was the Perfect Keto flavor I had been less excited to try than chocolate, especially since I’d already experienced fruity ketones with Zhou Nutrition’s Keto Drive. I decided to shake it into a water bottle, and it surprised me by turning a whitish color that reminded me of vitaminwater zero squeezed. I expected it to turn a peachy color rather than a creamy color for whatever reason. 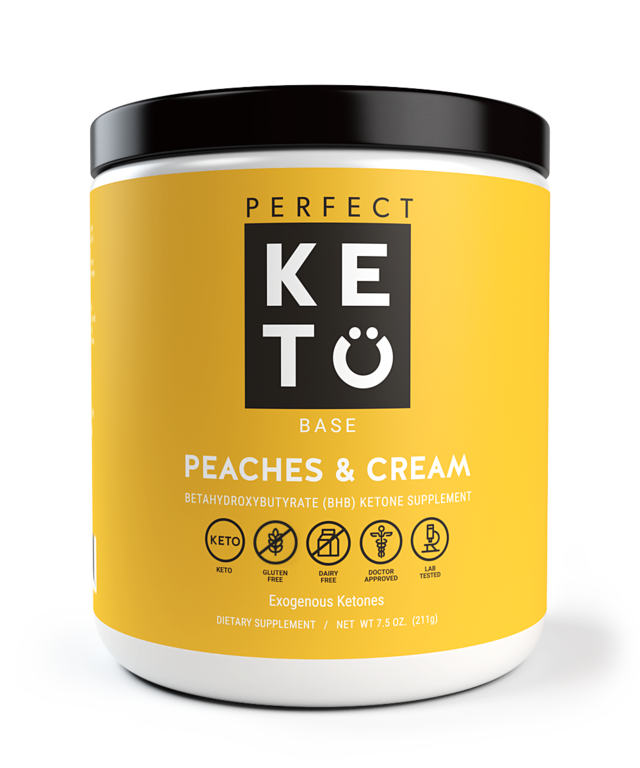 Perfect Keto Exogenous Ketones in Peaches and Cream. Buy it here and use discount code FISHYKETO at checkout for 15% off! The peachy taste was the second surprise. It tasted like eating a real peach, and I definitely miss my sugary fruits on keto. Plus, the “cream” flavor added a new dimension that the other fruity BHB salts I’d tasted lacked. While Matcha Lemonade Keto Drive may remain my favorite ketone flavor, I’ll have to go back and try it again and see whether I like Peaches and Cream equally or better. Peaches and Cream Perfect Keto Base has become a real contender for my all-time fave. I already mentioned the difference between the Perfect Keto and Zhou Nutrition Keto Drive flavors and the fact that both brands have flavors I enjoy. Another factor to note is the nutritional profiles. Both brands of exogenous ketones also contain calcium, though Keto Drive has 850mg (86% DV) and Perfect Keto has 539mg (59% DV). Keto Drive also contains 2333 IU Vitamin A (as beta-carotene, 47% DV), whereas Perfect Keto doesn’t appear to contain any at all. However, when it comes to magnesium, Perfect Keto is the clear winner with 323mg (84% DV) compared to Keto Drive’s 110mg (28% DV). Low magnesium can lead to keto flu symptoms when starting a LCHF diet, so it’s an important supplement for those on keto. To learn more about what I thought about Zhou Nutrition’s exogenous ketones, you can check out my Keto Drive review. Perfect Keto Base is available on Amazon and on the company’s website. The price of $59.00 is the same at both places for for a one time order (well, technically it’s 58.99 on Amazon), though Perfect Keto’s site offers you 15% off if you subscribe to deliveries (every 30, 45, or 60 days…but keep reading for a 15% off code you can use without subscribing). Amazon offers only 5% off for subscribers. You can only get the 15% off through Amazon if you subscribe to five products. When you visit Perfect Keto’s site, you should see a popup offering you 10% off your first order. Better yet, I have a 15% off promo code you can use when you order even if you don’t subscribe: FISHYKETO. You can use this code on any Perfect Keto product, not just the BHB salts. Perfect Keto is always offering deals for their customers on their website (and occasionally giving away products for free! ), whereas the Amazon promotions aren’t as impressive. If you’re still experiencing sticker shock over the price, you might want to check out Perfect Keto’s article explaining why ketones are expensive. The price is worth it if you want the benefits, and Perfect Keto’s prices are comparable to that of other quality brands like Zhou Nutrition. 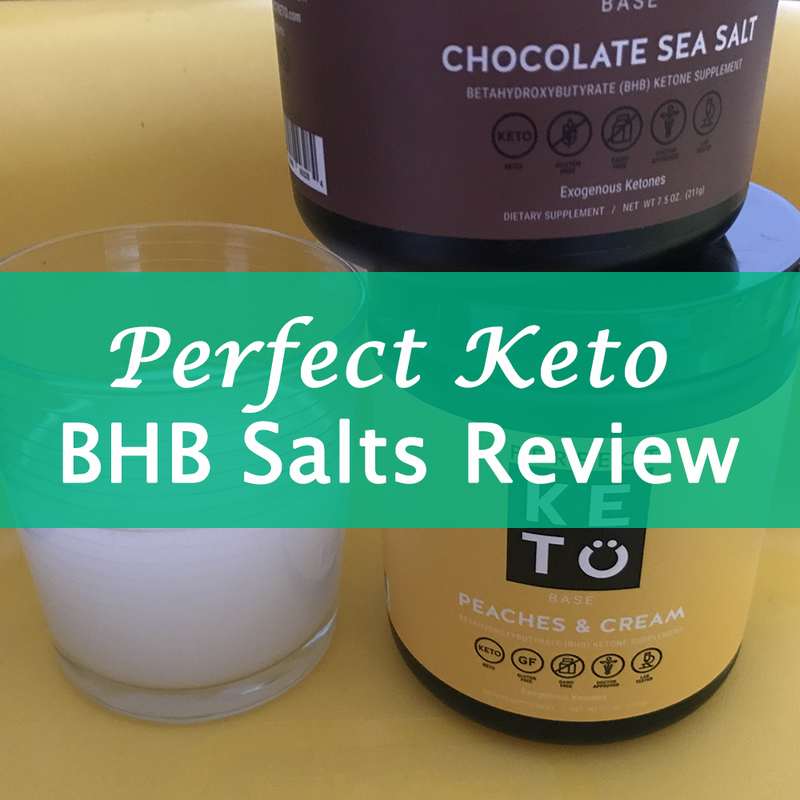 Have you tried Chocolate Sea Salt and Peaches and Cream, and do you agree with my review? Let me know in the comments section. Also, if you’ve had the Vanilla and Coffee flavors, let me know what you thought and which one I should try next. This website uses affiliate links, which means that I may get compensated if you click a link to a product featured here and buy it. Use my code FISHYKETO for 15% off your Perfect Keto order! Check out my Nui cookies review! 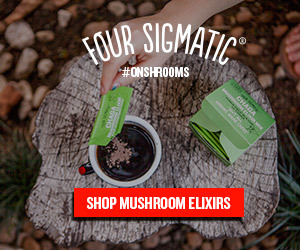 Use my discount code FISHYKETO for 10% off medicinal mushrooms!